Concord In Love | Concord In Love, Inc. I created a special offer for those of you who desire to gift a special experience this Holiday Season. It has already been proven that quality of relationships are essential to our happiness and well-being in life. 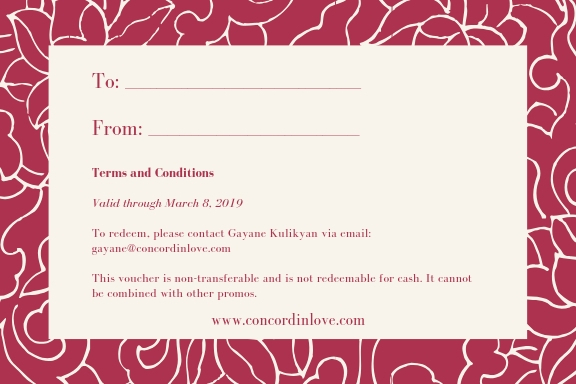 If you know of someone who would benefit from experiencing deeper connection, intimacy and fulfillment in relationships, I invite you to purchase this gift certificate for them. First appointment includes a 45 minute Discovery Session which will give me the opportunity to understand client’s challenges and difficulties, as well as explain what kind of work will be necessary to engage in. Together, we’ll choose one area to focus on. Second appointment is a 60 Minute Coaching session in which we’ll address the area of focus from the “Discovery Session” and move deeper into the transformative nature of work.